BlackBerry Presenter brings mobile PowerPoint presentations | BlackBerry Blast! 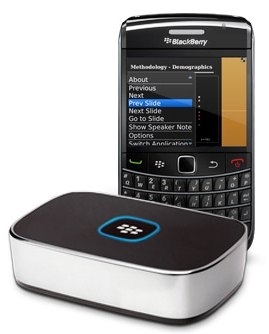 RIM has announced a new product called the BlackBerry Presenter that allows you to give PowerPoint presentations from your BlackBerry. "Leave your laptop behind and use BlackBerry® Presenter to deliver Microsoft® PowerPoint® presentations - directly from your BlackBerry smartphone. Simply plug BlackBerry Presenter into a projector or monitor and select “Present” from the wizard on your BlackBerry smartphone."